Tayo Rockson is the CEO and President of UYD Media, a media company that encourages people all over the world to use their difference to make a difference while celebrating diversity and educating others. He is an avid writer whose work can be seen on the Huffington Post, Among Worlds Magazine as well as Global Living Magazine. He is an authority on Third Culture Kids and assimilation into new cultures. He is the author of The Ultimate Guide To TCK Living and through his podcast and blog, he is heard and read by thousands of people in over 100 countries. His goal is to ultimately leave the world a better place than it was before he came into it. What does the term TCK mean to you? Do you identify with being a TCK? Yes, and I consider myself a citizen of the world. As a diplomat child, I grew up in four different continents and lived in 5 different countries (Nigeria, Sweden, Burkina Faso, Vietnam and the United States) since birth in Lagos, Nigeria. 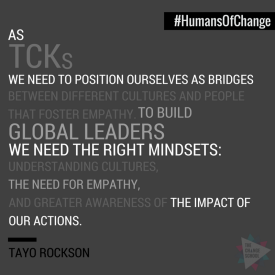 Is being a TCK the same as being a Global Citizen? I think they are; we are constantly in transition and we have the power to make an impact. What is the role or calling for adult TCKs and CCKs as Citizens of the World? Defeat the “supposed to syndrome” - understanding and accepting that we’re not supposed to be any particular way and that you’re identity crisis is necessary for who you become. Breaking down the Berlin Walls - racism, stereotypes and resistance to change are today’s Berlin Walls that are causing chaos. As TCKs, we can offer truth and educate others as natural teachers / ambassadors. Connect in a digital world - Our natural ability to connect naturally across cultures can be applied in digital format - through writing, podcasting, creating courses, consulting… find your way through the internet and USE IT!